TN Box Office - How has Sethupathi fared? Sethupathi's USA premiere details are here! It all ends by this month for Vijay Sethupathi, Tamannaah and team! What are Vijay Sethupathi and Tamannaah doing in Courtallam? Exclusive: Vijay Sethupathi to team up with the real 'Enna Achu?' guy! Dhanush and Vijay Sethupathi confirm for Vetri but no Jiiva? 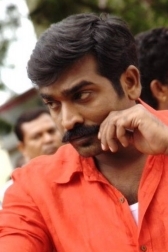 Four heroines for Vijay Sethupathi! Vijay Sethupathi does it again! Sethupathi aka Sethupathy is a Tamil movie with production by Vansan Movies - Shan Sutharsan, direction by SU Arun Kumar, cinematography by Dinesh Krishnan, editing by A Sreekar Prasad. The cast of Sethupathi aka Sethupathy includes Remya Nambeesan, Vijay Sethupathi.